It is with great pleasure that I send you the eighth issue of our academic journal, Napoleonic Scholarship. In it we feature a wide range of excellent articles, including some from top scholars in the field and others from outstanding graduate students and other researchers. All of the articles were peer reviewed and meet the high standards set by the INS. In this issue we also include, for the first time, a number of original documents from the period. We have scanned them and had them translated into English. I have written a brief introduction to each of them to provide historical context. While those documents are in the journal, this email also contains higher resolution direct links to each one of them, where you can download them in PDF format. It is my hope that you will post these documents to any sites you feel appropriate. If your library or your history department retains such files for research, please share these with them. It is important that as wide an audience as possible have access to these documents. We will continue this project in the years to come. As always, I want to thank our Editor-in-Chief, Wayne Hanley, and our Production Editor, Edna Markham, for their outstanding work in producing this journal. 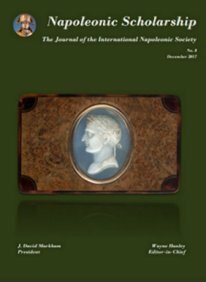 Thanks to their efforts, and the outstanding articles that were submitted, we can all be proud of this issue of Napoleonic Scholarship. If you have difficulty downloading the PDF of the journal, please let me know and I will send you the file directly. It is with great pleasure that I send you the seventh issue of our academic journal, Napoleonic Scholarship. In it we feature a wide range of excellent articles, including some from top scholars in the field and others from outstanding graduate students and other researchers. All of the articles were peer reviewed and meet the high standards set by the INS. This issue is the second issue being present solely in digital form. We have received virtually universal approval of our move to this format, with all the advantages it offers. Here is the link that will take you to the PDF version of the journal. From there, you can either read it online or download it to your computer as a PDF file. Each listing in the table of contents is a link that when you click on it will take you directly to that article. We are pleased to present the 2015 INS Journal. 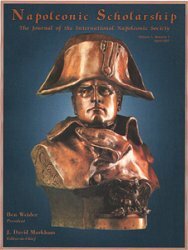 I know that you will find it, as always, full of outstanding articles on various aspects of Napoleonic History. Wayne Hanley, our new editor-in-chief, has done an outstanding job in getting excellent papers from a wide range of scholars. This journal is notable for another reason as well. From now on, the journal will be produced as a PDF journal and be distributed using website links to our Fellows via email. In addition to being cheaper than a traditional printed journal, this format allows for a far wider distribution of the journal with no additional cost. 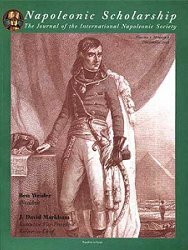 For example, we are providing the journal to all members of the Napoleonic Historical Society, and will make it available to other interested groups, either via email or by posting it on various websites. As always, it will be posted on the INS website, but it will now be posted on the NHS website and several Facebook pages as well. This will give our authors—and Napoleonic history—a much wider audience than before. We also welcome our new Production Editor, Edna Markham. She has completely upgraded our ability to communicate with our Fellows via mass emails, and has also upgraded the production of the journal. Her technical skills are an invaluable addition to our team. We plan to stabilize the release of new journals to a consistent one each year. We urge you to send submissions for future issues. Finally, we call your attention to our upcoming congress in Dublin and to future congresses. These congresses are outstanding opportunities to meet and mingle with scholars from around the world. We encourage you to attend and to strongly consider submitting a paper proposal. I am proud to send you issue No. 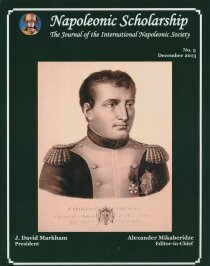 5 of Napoleonic Scholarship: The Journal of the International Napoleonic Society. Due to circumstances beyond our control this issue suffered a significant delay. However, as always, Alexander Mikaberidze has put together an outstanding collection of top scholarship in our field. We are already planning the next issue and I urge you to submit papers for consideration. I am quite sad that Alex, my close friend and colleague for many years, is resigning as Editor-in‑Chief due to increasing work commitments. However, I am delighted that another close friend, Dr. Wayne Hanley, has agreed to accept the position. Wayne is Chair of the Department of History at West Chester University in Pennsylvania. Wayne is a top scholar and I have every confidence that he will do an outstanding job. You can reach him at whanley@wcupa.edu. This year is the 5th anniversary of our founder and my friend Ben Weider's death. 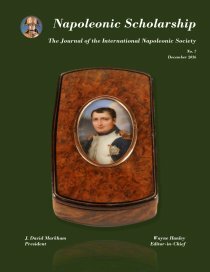 I am proud that this journal and other INS activities are still a major part of his Napoleonic legacy. I present you with great pleasure issue four of Napoleonic Scholarship. This issue is larger than previous issues as we received a record number of outstanding submissions. 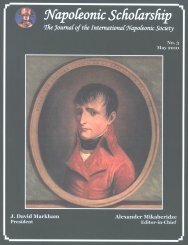 In this issue you will find articles from scholars from around the world on a wide range of Napoleonic topics. As always, we take great pride in being the only English language academic journal dedicated to Napoleonic history. I again thank our editor-in-chief, Alexander Mikaberitze, and our production editor, Rowayda Guirguis, for their hard work in making this an outstanding issue. The next issue promises to be equally outstanding and will include some papers from our recent International Napoleonic Congress in Moscow. I am pleased to welcome you to the third issue of Napoleonic Scholarship, and the first issue since 1998. This past year has been very eventful for the INS. When I became president I was determined to move the INS forward in ways that would honor Ben Weider's legacy and reflect the sholarship that is the essence of our Society. This journal is a major part of what we are all about. It is only English-language scholarly journal dedicated to the study of Napoleonic history. I was most fortunate in being able to recruit Alexander Mikaberitze, one of the brightest young stars in our field, to serve as editor-in-chief. Helped by a distinguished editorial review committee, as well as our production editor, Rowayda Guirguis, we have created what I hope you will agree is an excellent issue. We encourage you to give us any feedback you wish, as well as to consider contributing to the 2011 issue. This journal, and all other activities of the INS, were made possible by our founder and first president, Ben Weider. We believe that the journal reflects his spirit, and it is to him that we dedicate this issue of Napoleonic Scholarship. Welcome to the second edition of Napoleonic Scholarship. We are gratified by the overwhelmingly positive response to the first issue. In this issue, we present papers from four continents and seven countries. To bring to western scholars material never before translated, especially from Russia and Eastern Europe, we offer work by two Russian scholars. 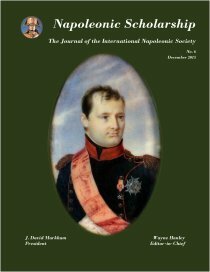 The International Napoleonic Society (INS) has held four International Congresses - the first in Alessandria, Italy, in 1997; the second in Tel Aviv, Israel, in 1999; the third in Tbilisi, Republic of Georgia, in 2000; the fourth in Dinard, France, in 2005. There are currently 41 affiliated countries. 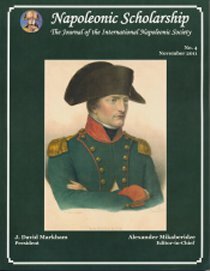 This journal is dedicated to bringing together important Napoleonic scholarship from around the world and making it available to scholars, history departments, and libraries worldwide. Producing "the first" of anything is always exciting, and that has certainly been true with this first issue of Napoleonic Scholarship. Thanks go to our scholars for their contributions and especially Don Howard for his invaluable advice and support. And most of all, many thanks go to Ben Weider for making this all possible. His personal and professional support have made the production of this journal a most pleasant experience. Napoleonic Scholarship is a production of the International Napoleonic Society (INS). The INS is registered with and recognized by the Government of Canada.